Flooding in St. Paul this Spring? The chart above is from the Advanced Hydrologic Prediction Service with the National Weather Service. 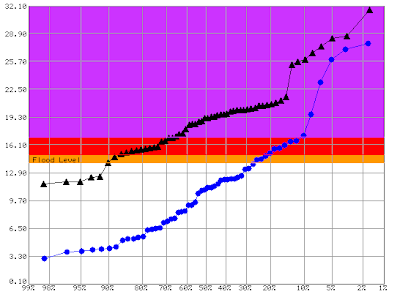 This chart is the most recent predictions for spring river levels in downtown St. Paul. This prediction was released on the 16th. The vertical values are the height of the river in feet. The horizontal values are the percentage chance of that height being attained. The black line is the current predictions for river height based on observed conditions such as current river flow and snow pack. the blue data are the observed averages from the historical data. The first thing you notice is that no matter where you look on the chart, the observed values are higher than average. We can see that historically there is about a 25% chance of the river reaching the yellow line which indicates a flood level of 14 feet. Based on observed conditions, there is currently a 90% chance of the Mississippi river reaching flood level at downtown St. Paul. 14 feet is considered "minor flooding" and according to the NWS, at 14 feet, "Portions of the Lilydale residential area begin to experience flooding." Harriet Island becomes submerged under water at 17.5 feet. This is considered major flooding. It looks like there is about a 65% chance of that happening based on current conditions. Warner road becomes impassable due to high water and the downtown airport closes at around 18 to 18.5 feet. Historically there is about an 8% chance of this happening in a given year. Current predictions for this spring are around 55%. Of course, what will actually happen will depend a lot of what this next month brings in terms of precipitation. More snow will increase the chance of flooding as will March rains. A fast warm-up quickly melting snow and sending it to the river would increase flooding as well. It should be an interesting spring.